The Aboriginal Culture, Heritage & Arts Association exhibition From our place: an exhibition from NSW Aboriginal cultural centres starts its NSW tour this month. 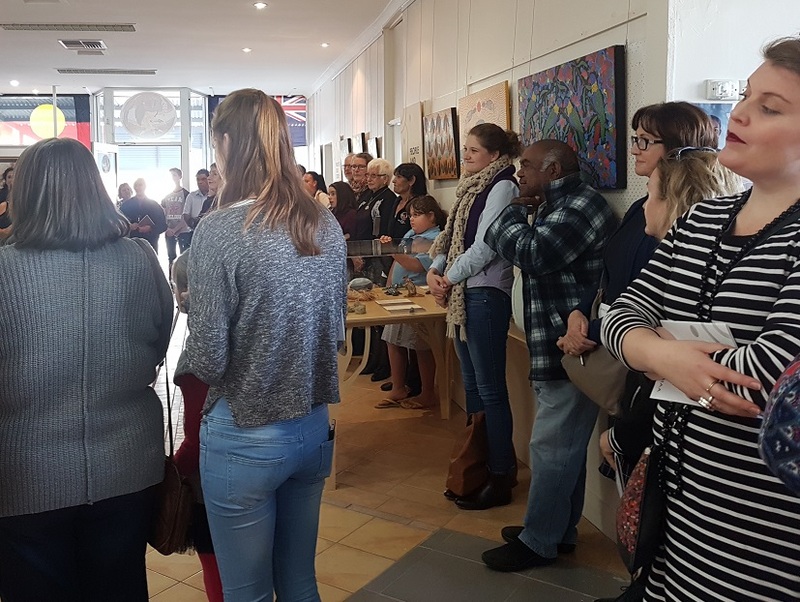 The exhibition, currently on show in Deniliquin at the Yarkuwa Indigenous Knowledge Centre, will open on Saturday 27 May at the Bundawarrah Centre in Temora on Saturday 27 May at the start of Reconciliation Week 2017. It will be on display there until Sunday 27 August before opening at the Yarrawarra Aboriginal Cultural Centre at Corindi Beach on Friday 8 September, until Saturday 4 November. The final stop for the exhibition will be the Muru Mittigar Aboriginal Cultural Centre, opening on Thursday 9 November until closing in early February 2018 at a date to be determined. The tour has been made possible by a strategic grant from Create NSW, the NSW Government department until recently known as Arts NSW. The grant money supports the tour as well as a series of public programs involving local Aboriginal artists and performers at each location. It will also support a two day conference workshop for ACHAA members and stakeholders at Muru Mittigar on 14 and 15 November. From our place curator Alison Williams from the Yarrawarra Aboriginal Cultural Centre, has been re-engaged to oversee dismantling of the exhibition, transport and installing at each venue. “Unlike other states, there is no real uniformity or genre of Aboriginal community owned cultural facilities in NSW,” explains Williams who was also the inaugural Chair of ACHAA. “Each has been a response to its community’s desire and will to have its own keeping and meeting place where art and culture can be collected, maintained and renewed through practice and application. “Broadly that’s the objectives of all the ACHAA member organisations represented in this exhibition, to ensure NSW Aboriginal culture remains not just viable but actually thrives through visibility and engagement. The local difference is what vessel the community has identified for that to be established – as a cultural centre, knowledge centre, art gallery, keeping place or museum. “There are also vastly diverse landscapes across NSW and this is represented in the centres’ collections as engagement with the land is central to Aboriginal cultures. From our place is the first exhibition from ACHAA and the first time works have been exhibited from NSW Aboriginal owned cultural centres, knowledge centres and galleries. The nine galleries represented in the exhibition are: Muda Aboriginal Corporation (2CUZFM Bourke); Dharriwaa Elders Group (Walgett); Minjungbal Aboriginal Cultural Centre (Tweed Heads); Yarrawarra Aboriginal Cultural Centre (Corindi Beach); Dunghutti-Ngaku Aboriginal Art Gallery (Kempsey); Armidale Aboriginal Culture Centre & Keeping Place; Boomalli Aboriginal Artists Co-operative (Leichhardt); Muru Mittigar Aboriginal Cultural Centre (Rouse Hill) and Yarkuwa Indigenous Knowledge Centre.